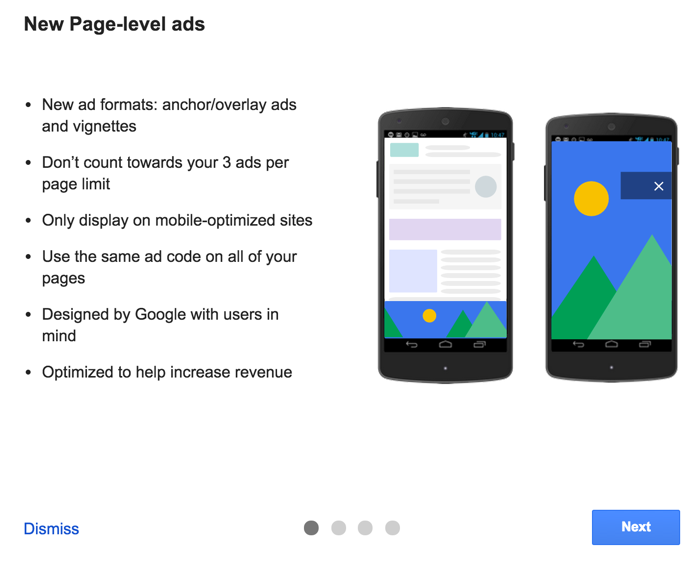 Page-Level ads are the ads which display on mobile while using a site. These ads are introduced by Google Adsence for better customer experiences. These are next generation ads of google adsence. This new series of ads focus on mobile traffic and visitor experience. So, the visitors to your blog/website become happy and you can earn more money. Know About: About 50 shortcut keys in MS word for easy documentary.. There are mainly two types of page-level ads are there they are..
Anchor ads are also called as overlay ads. These page level ads stick to the edge of the user screen and easily dismiss able by user. They are also loaded separately at background in your site webpages. These page level ads appear between pages of your website/blog and can easily skip by the user any time. They are preloaded at your website. So, it ready to go when user dismisses it. Steps to use Page-Level ads. Login into your adsence account. Click on my ads button on the top. At your left click on page-level ads. Turn on the type of page-level ads you want to use in your website (You can select both). Click on get code button there you can see a code which is in between <script></script> tag. Copy the code and place it in the <head> tag of your web site.